Undergraduates from the biology, chemistry, and molecular biology and biochemistry majors showed off their science at the 2018 meeting of the American Society for Biochemistry and Molecular Biology. From left, Alex Shames ’18 (MacQueen Lab), Arden Feil BA/MA ’18 (MacQueen Lab), Will Barr ’18 (Weir Lab), Christine Little ’18 (Mukerji Lab), Cody Hecht ’18 (Taylor Lab), and Emily Kessler ’18 (Hingorani Lab). 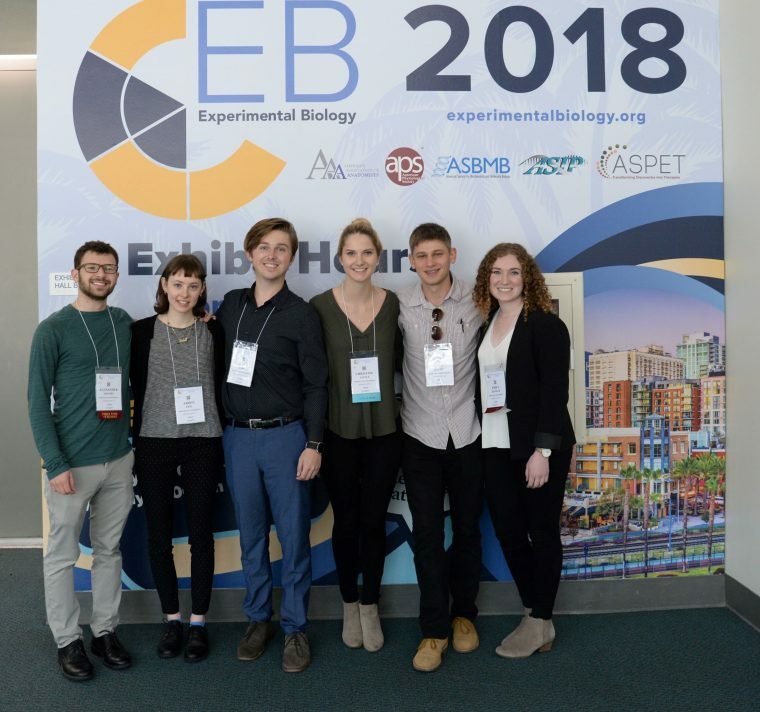 Seven Wesleyan students recently were inducted into the American Society for Biochemistry and Molecular Biology (ASBMB) Honor Society, and many of them presented research posters at the ASBMB annual meeting in San Diego, April 21–25. The ASBMB Honor Society recognizes exceptional undergraduate juniors and seniors who are pursuing a degree in the molecular life sciences for their scholarly achievement, research accomplishments, and outreach activities. The Wesleyan students inducted were Will Barr ’18, Alexa Strauss ’19, Emily Kessler ’18, Christine Little ’18, Julie McDonald ’18, Rubye Peyser ’18, and Alexander Shames ’18. The mission of ASBMB is to advance the science of biochemistry and molecular biology through organization of scientific meetings, advocacy for funding of basic research and education, support of science education at all levels, promotion of the diversity of individuals entering the scientific workforce, and publication of a number of scientific and educational journals, including the Journal of Biological Chemistry and the Journal of Lipid Research.